Riding on the road is dangerous. Either cars don’t see you or don’t care to see you. Drivers do not know the law about passing cyclists or don’t care about the law. Oftentimes, it feels like you are a sitting duck out there, waiting for one too many aggressive drivers to make a fatal mistake. Biking on the road should be a fun and revitalizing experience, but oftentimes turns into a frustrating anger-fest with drivers clipping you, yelling at you, cutting you off, or worse. Well, now you can take the road back for you and your bike and nail your commute with less aggravation and more confidence. 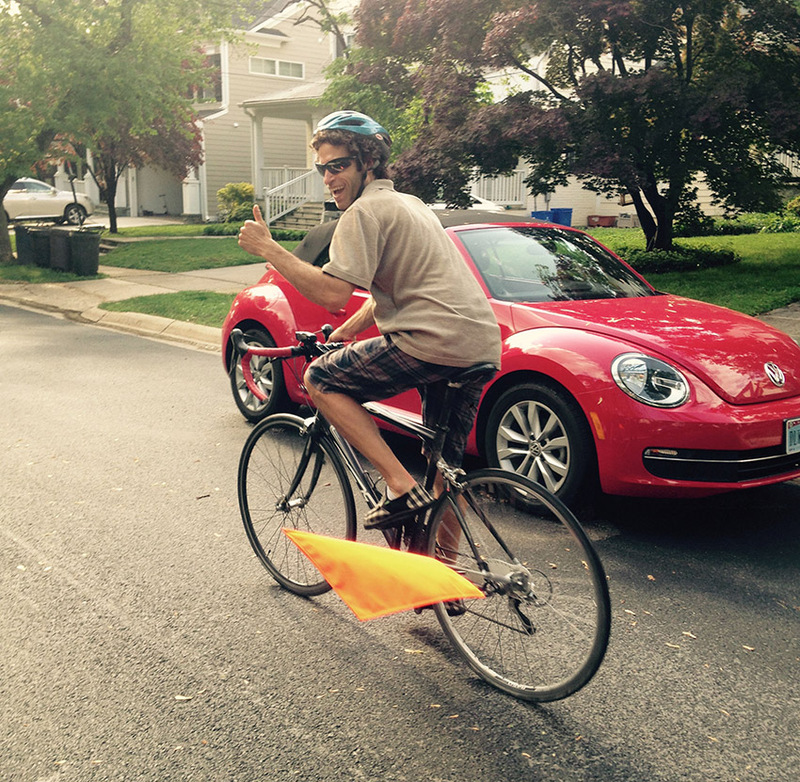 The Three Foot Flag is a solution for bike commuters everywhere. 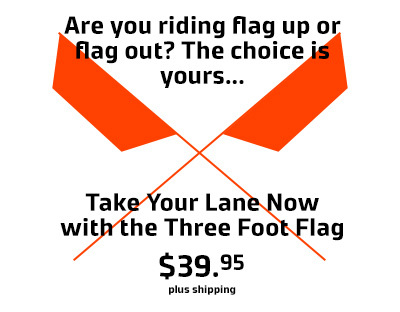 The adjustable flag is easy to spot for drivers and, when adjusted horizontally, can visibly demonstrate the safe and legal three-foot passing distance to drivers. It is like creating your own bike lane. What a relief to be out there with such visibility and have the freedom to just ride. 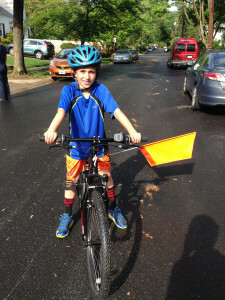 The flag has the flexibility to bend, and not break through inadvertent contact with cars, bikes, or other obstacles. 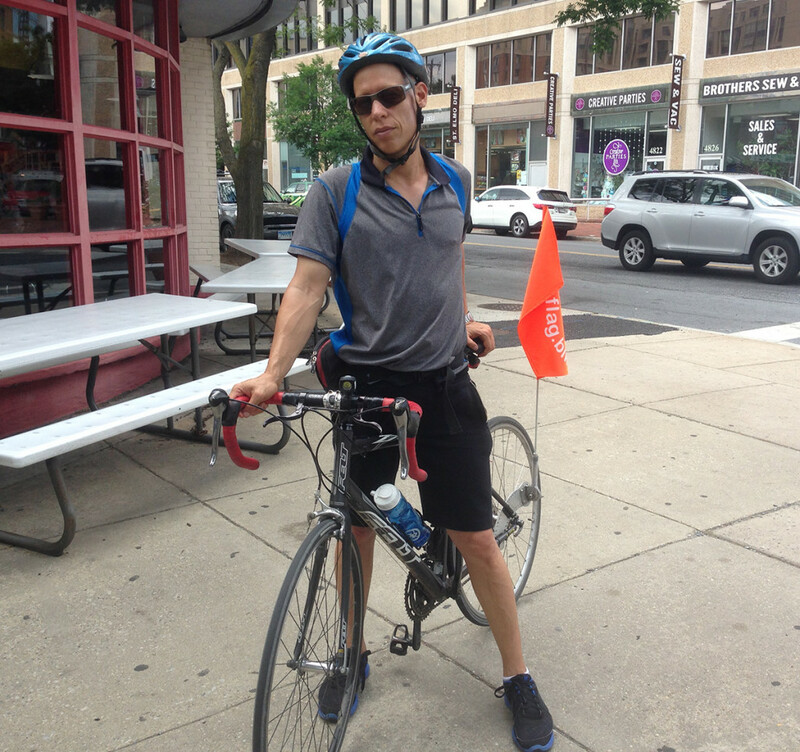 Heavier contact will result in flag quickly and entirely disengaging without disrupting the bicycle or its rider. The flag’s luminous safety orange nylon material is hard to miss no matter the position of the flag. The adjustment mechanism is made of high-quality cast aluminum with stainless steel hardware. Each of the six adjustment positions is locked into a robust cast aluminum notch and held in place with a strong stainless steel spring. The aluminum universal mounting bracket attaches to the bicycle frame with four 70-pound tensile strength nylon ties and elastomer cushioning. This easily assembled attachment provides bikes of all shapes and sizes with the same consistent horizontal indicator functionality no matter what manufacturer and model bike is being ridden. The aluminum, stainless steel, fiberglass, and nylon materials allow for all-weather utilization with no maintenance concerns. The horizontal indicator, flag with fiberglass rod, universal mount and all of the attachment material weighs in at approximately 15.3 ounces. Worried about your kids riding around your neighborhood or your teenager riding his or her bike to school? Vastly increase their visibility with the adjustable three foot flag. Guarantee that cars can see your children coming and going and give them the space they need to grow up safe and stay active with confidence. Like to take your young ones on the road with their training wheel bikes? Have confidence that your blindside is protected with the Three Foot Flag. 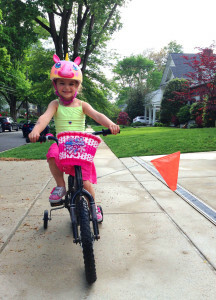 When you take your lane with our brightest adjustable flag, cars can see you and your child coming and going. They MUST give you a wide berth when passing. The Three Foot Law in your state or city.